Camping is a great way to relax. It helps us to get away from the stressors of our digital lives and can help reset our moods as we confer with nature. The only downside to camping is that a good night’s sleep can be elusive, as you curl up on the cold, hard, ground, and try to find a comfortable position. Fortunately, there is an entire market of camping sleeping pads out there that can help you achieve a restful night’s sleep, even when you are out in nature! Below are our six favorite camping sleeping pads that you can find on Amazon. They are split into two categories: inflatable pads and foam pads, so figure out which camp you fall into (pun intended), and make the purchase. Your back, neck, and mood will thank us in the morning! These camping sleeping pads are super compact when they are deflated, making them a great option for anyone hiking to their camping spot. They all inflate quickly and easily and are great for both comfort and transport. This consists of dozens of air cells, which can conform to your position as you sleep. The air cell design also makes it super easy to inflate. Just ten to twenty breathes through the large air valve and you have got yourself a mattress! It is super compact and easy to carry, with the carrying case measuring 8” x 3.5” and the entire thing weighs just 1lb. This is an ideal solution for a backpacker who doesn’t want to sacrifice packing space for comfort. With this pad, you can have the best of both worlds! It comes in blue, green, and orange, so pick which color best suits you and hit the trails. If the thought of blowing up your own sleeping pad doesn’t thrill you, this is a fantastic solution. It even comes with a built-in pillow. 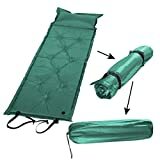 To use the sleeping pad, simply unroll it, and twist the air valve to let air flow freely in. It will inflate within minutes. You do have to blow up the pillow manually, but it should only take a breath or two to accomplish. This pad is water resistant and comes with snap buttons along the sides that allow you to join it to other pads for a larger sleeping area. It will keep you a full two inches off of the ground, and rolls to store and transport, making it roughly the size of a yoga mat. This pad would be easy to throw in the back of your car with your camp chairs. This sleeping pad marries the best features of the previous two. It is light, compact, and self-inflates. This pad even comes with a self-inflating, removable pillow! To use it, just take it out of the carrying case (13” x 6.3” x 6.3”), and twist the air valve to inflate. It weighs a bit more, at 2.1lbs, but if you want the benefits of both a pillow and self-inflation, it is hard to beat this option. It comes in green and blue, so make some extra space in your backpack, and bring this on your next adventure. If you are not a fan of inflatable camping sleeping pads that can sometimes leak air while you are sleeping, then a foam pad is probably the solution for you. These pads require absolutely no set up – just unroll and hit the hay. This foam pad is made from “virtually indestructible” cross-linked polyethylene, so you don’t have to worry about how rough the terrain you are setting it on is. It is lightweight and features heat-trapping valleys that will help keep you warm and insulated as you slumber. Therm-a-rest is a trusted outdoor supplier that has been keeping campers safe and comfortable for nearly 40 years, so you can trust that this is a quality product purchase. If you don’t want to worry about inflating anything before spending the night outdoors, then it is hard to go wrong with this purchase. This camp pad actually comes in several sizes, with the Universal measuring in 80” long, 30” wide, and 2” thick. This pad is designed to fit on the Teton sports cots, but works just as well alone on the ground. It features a few key storage pockets, one for your pillow, keeping it clean and in place, and one for your wallet and keys. It also features a roll assist bar, heavy-duty snap closures, and a built-in carrying handle. 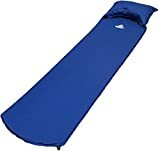 This isn’t a great option for anyone hiking a good distance to get to their campsite, but for short hikes or drive-up camp spots, you can stay comfortable all night long on this sleeping pad. LaidBackPad Memory Foam 24” x 72” x 2 3/8” Camping Mattress for Great Sleep While Camping or at Home with Built-in Connector and Weighs 8.5 lbs. This sleeping pad is the Cadillac of outdoor sleeping pads. It is not compact, weighing 8.5 lbs, and resembling a bulky sleeping pad when it is rolled up. But it is almost guaranteed to keep you so comfortable you might forget that you are not in your own bed. 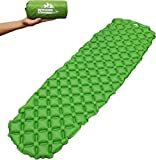 So the next time you hesitate about going on a camping trip due to back problems, still joints, or a sore neck, remember to bring along one of these sleeping pads to accompany your sleeping bag. You will be surprised by how well you sleep among the dirt and rocks of the rustic outdoors. Happy camping and sweet dreams! Which Air Mattress Should You Bring Camping?